Just to show the idea really, but thought I’d post a picture of a cake that my sisters and I designed, made and decorated for our Mum’s 60th birthday party in 2009. Mum loves Japanese themed designs and has always put a huge amount of effort into our parties and into making us spectacular cakes when we were children. 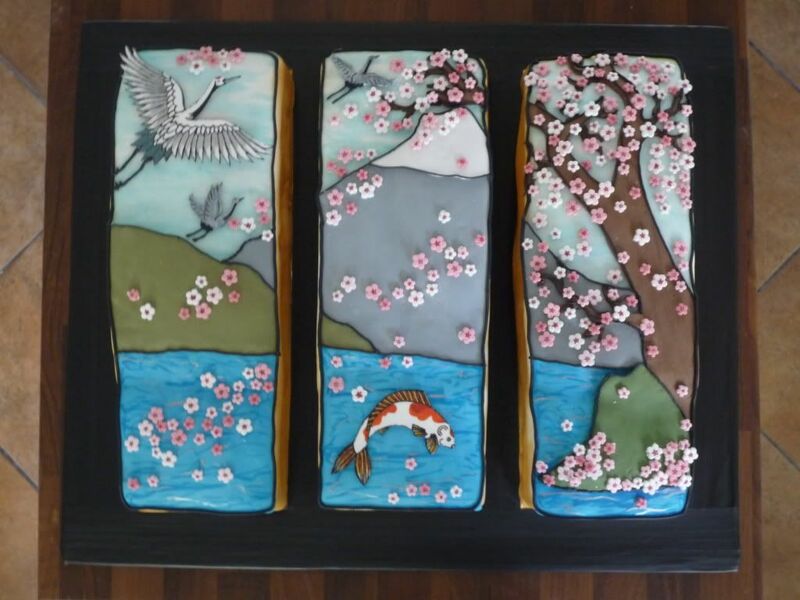 So we wanted to think of something special and came up with a concept for 3 cakes representing her 3 daughters and showing a beautiful Japanese scene. Each cake is a chocolate cake made to a family recipe and filled in the middle with home made plum jam and chocolate fudge icing. We baked them as one huge cake in a big square cake tin, and when it was cooked we cut it into thirds (for the 3 panels) and then each chunk was cut horizontally in half so that we could add the filling. Each panel was placed on a large board (we used a big chopping board rather than a more flumsy cake board to support the weight), covered in greaseproof paper. We then covered each cake with white fondant icing. We’re not professionals, and so are never able to make the sides and tops completely square, but we think the slightly lumpy shape adds to the charm! To decorate, we first used edible gold spray paint that we bought from the cake decorating shop to spray all of the sides of each panel to make it look really special. We had previously planned the picture for each panel and so drew out the design for the scene on greaseproof paper as a template to follow. The tree, mountain, snow, hills and lake were all made by colouring smaller pieces of the fondant icing, rolling it out and cutting out the shapes. We cut the shapes by first tracing them onto greaseproof paper, placing the paper template on top of the rolled out icing, and using a pin to prick through the paper all around the line and through the icing. When you take the paper off, you have a faint dotted/pin-pricked line to cut around to get the icing the right shape. One artistic sister then used food colouring pastes as if they were water colours to paint the cloudy sky, watery lake, and the tree bark. To finish the background and to frame each panel, we mixed up some black icing from icing sugar, egg white and food colouring, and used a piping bag to carefully pipe around the outline of all of the shapes. In the meantime, we used sugar paste to make the carp, cranes and cherry blossoms. The blossoms were made using a set of little blossom cutters in two sizes. We coloured the white sugar paste with different amounts of pink to make the different shades, and cut out loads of little flowers from each colour. When they were dry and hard, we used a pinky red food colouring paste to paint the little dots into the middle of the blossoms. When they were finished, we used normal icing made from icing sugar and water to stick them to the cake. The carp and cranes were made by drawing the design on greaseproof paper and then pin-pricking onto the rolled out sugar paste. We copied the designs from pictures we found online, and from some kimono fabric we had. We cut the shapes out using a very small sharp knife and then painted the design outlines in black. When the black was dry, I used more food colouring pastes as paints to add the coloured details to the feathers and scales. When finished, they were also stuck on to the cake with icing sugar and water. Many thanks to my gran for passing down these recipes, to my sister for adjusting them slightly and generally to my mum for allowing us to make this all the time when we were children! Sift all of the dry ingredients into a large bowl. Add the other ingredients and blend thoroughly until it’s gone significantly paler than it started (I use an electric hand blender and blend for about 10 minutes). Bake at 160 C for 25-35 minutes, depending on the tin shape. You can either do one big cake, or divide it between 2 shallower sandwich-cake tins to make filling it easier. Tastes great with the chocolate fudge filling (below) and jam. For our wedding cake we also added whipped cream. Yum! Melt butter, castor sugar and water in a pan until sugar is fully dissolved and it’s all liquid. Meanwhile, sift the other ingredients into a bowl. Add the melted hot liquid to the dry ingredients and mix thoroughly until icing consistency. Use imediately to fill and/or ice you cake. If it starts to get too stiff (or you leave it too long and it starts to go hard), simply add a bit of boiling water to loosen it all up again. When icing, use a metal knife/palette knife and regularly dip it in boiling water to make spreading easier and to get a nicer finish on the icing. I’ve also kept this in a jar in the fridge to use as grown up chocolate spread (you need to mix in a bit more butter to help keep it softer) and it tastes lovely in pancakes with bananas and nuts and cream! This entry was posted in Kitchen, Sweet Things and tagged cake, cake decorating, chocolate cake, chocolate fudge filling, fondant icing, icing, japanese scene, panel cake, sugar paste. Bookmark the permalink.